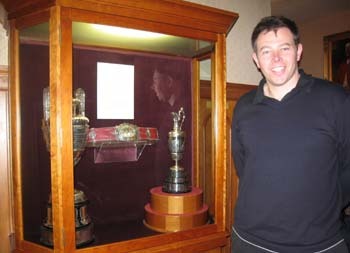 Last Thursday saw me standing as close to the The Silver Claret Jug as I’m ever likely to get! 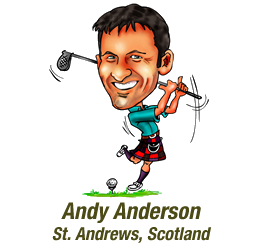 Every St Andrews Day the Royal and Ancient Golf Club of St Andrews allow the general public to look around the trophy room and the two main clubrooms. Thus I took the opportunity to have a nose and get a few photographs. This is indeed evident with old paintings like this one of Old Tom Morris and rut iron clubs dating back to the mid to late eighteenth century. In addition the trophies are amazing with the The Silver Claret Jug and the Amateur Championship Trophy taking centre stage in the main Hall. The Club was founded in 1754, though it was another 100 years before the Clubhouse was opened in 1854. Since that date there have been many expansions and it is fascinating to look at the old photographs and paintings to see how the building has been extended over the years. 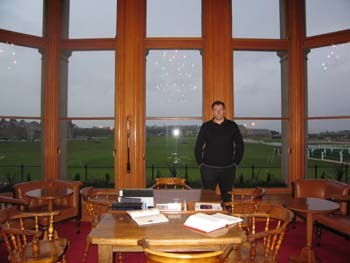 The large clubroom with its majestic bay window are the heart of the clubhouse. It now houses among other pictures a remarkable painting by Anthony Oakshett of HRH The Duke of York driving in as Captain of the R&A back on 2003. He had the honour of being the Captain of the Club in its 250th Anniversary Year, the sixth member of the Royal Family to have captained the Club. It was great to take in the view, if only for a few minutes!